Worried about spam? Don’t be. We hate spam, too. It’s like a bad date that never ends. We may contact you a month or so after you download a white paper to see if we can clarify any questions. You can opt out of future communications from us and we respect that. Many customer experience management professionals and technical communication professionals don’t talk to each other. As a result, customer experience doesn’t think about product instructions; technical communication professionals don’t think about the customer experience. And no one has a content strategy that drives revenue and reduces costs. But these fields are important to each other, as this white paper shows. Each field has something to offer the other. 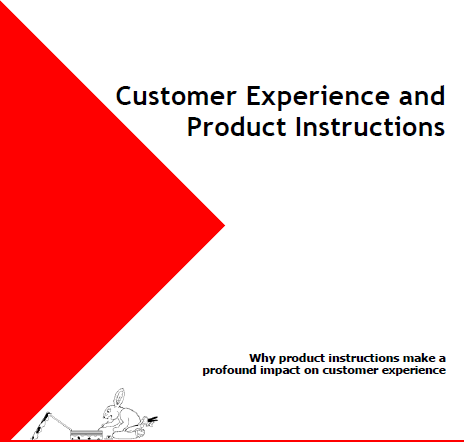 While not an complete dive into customer experience and product instructions, this white paper introduces some concepts and ideas from both fields. In the customer-centric world we live in, everyone is trying to create content and a content strategy that separates them from the competition. Some companies are doing it well and some are not. Generally, the companies that are not creating useful and meaningful content are also spending a lot of money for that content. But it doesn’t have to be this way. This white paper discusses how to deliver better content to your customers and spend less doing it.